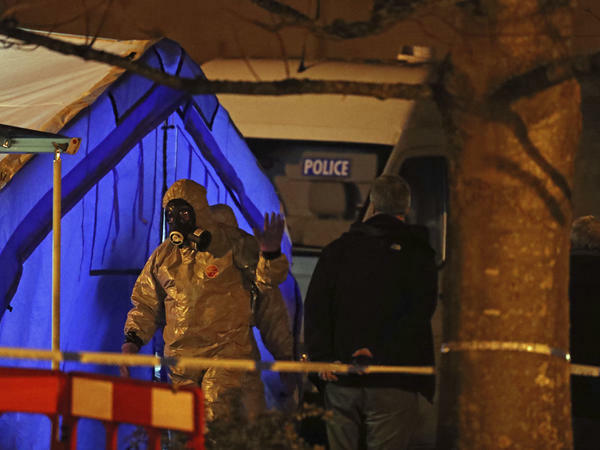 Investigators walk next to a police tent last year in Salisbury, England, near where former Russian double agent Sergei Skripal and his daughter Yulia were found critically ill. Exactly one year after a former Russian double agent and his daughter were found poisoned in the British city of Salisbury, the Russian government is accusing U.K. authorities of violating an international treaty by not granting them access to the two. Sergei Skripal and his daughter Yulia were discovered collapsed on a park bench near a shopping mall on March 4, 2018. Lab tests showed they had been exposed to the Novichok nerve agent developed by the Soviet Union during the Cold War. Russia denies any involvement. In a news conference Monday, Dmitry Polyanskiy, Russia's deputy ambassador to the U.N., questioned the British narrative that blames Russia for the attack. "We still don't know who did it, why and how, one year on," he said. "All our efforts to cooperate with the British side are being constantly rejected. They don't want to listen. They expect us only to tell them: either President Putin did this himself or he lost control of the people who did this." Polyanskiy says that the Vienna Convention requires Britain to allow Russia access to its two citizens to determine whether they are alive and need help from their home country. If the U.K. doesn't grant Russian officials access, he said, it could count as "forced detention or even abduction of two Russian nationals." The British government says the Skripals can make contact with the Russian government if they wish, but have not done so, The New York Times reports. A British diplomat told The Associated Press that the Skirpals are alive, "free citizens" who don't want to meet anyone from the Russian Embassy. The Russian Embassy in the the U.K. released a 52-page report Monday posing dozens of "unanswered questions" about what happened in Salisbury, and citing what it calls "inconsistencies in the British narrative." The incident, the report said, "has caused major international repercussions, bringing Russia-UK and Russia-West relations to a new low." Polyanskiy highlighted that Skripal had been in Russian custody for eight years, convicted of spying for Britain, and could have been targeted then. "And if we tried to kill him, why didn't we kill him actually?" Polyanskiy asked. "Were these agents kind of newcomers? They were interns? I don't know. Why didn't they do it if they were asked to do it? There are thousands of different methods, as you know from crime movies and novels, to fulfill this job. But why did we choose such a strange thing, such a strange method?"